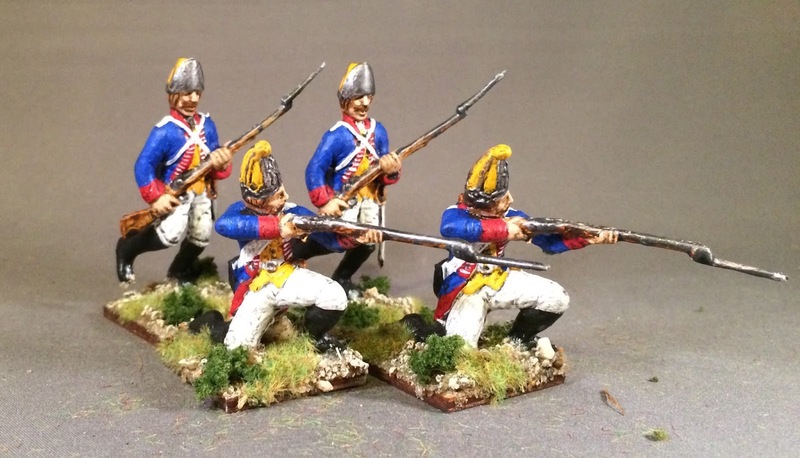 I had a bit of time to do some painting this week and I finished of a bunch of dismounted British dragoons in order to complete the mounted units I'll need for Tricorne. I had four guys from A Call to Arms. 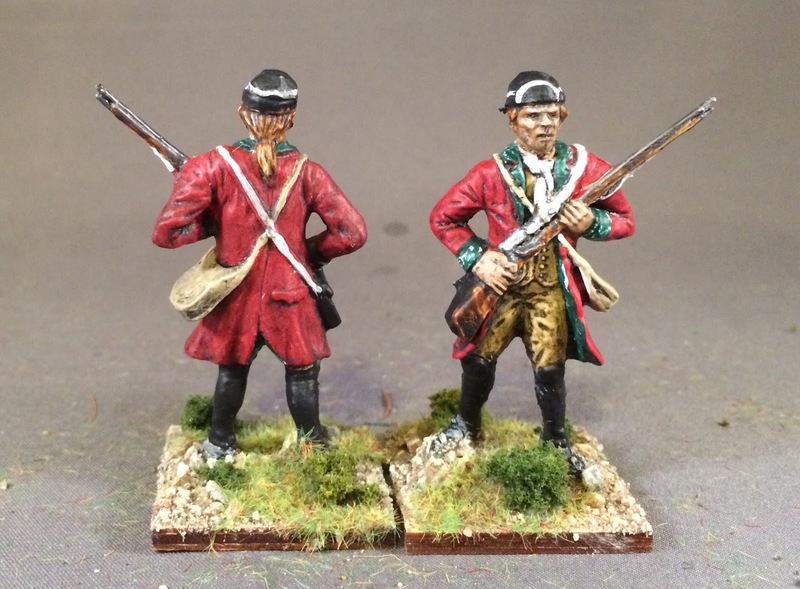 I needed two more so I borrowed two fellows from a Revell box (I've painted these sculpts in 1/72 from Imex). I had to scrape the "liberty" lettering off the front of the Revell caps. They will do as filler. I just needed some extra bodies that more or less finished off the units. My vision for mounted units is one or two fellows on horse and the rest of the unit on foot. Some of that is about how many 54mm figures I can get in a 4-inch hex. 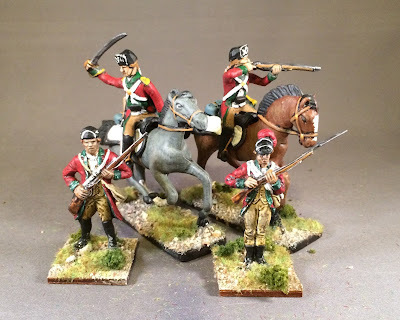 And some is about cost and how much I loathe painting cavalry in this scale. 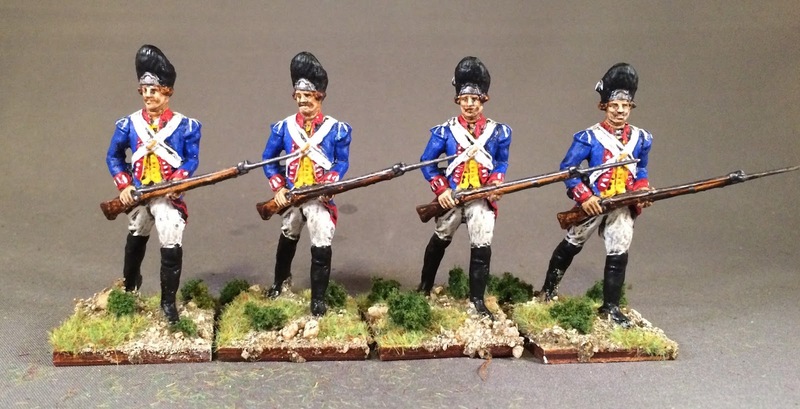 Up next: Some extra 54mm British lights and provincial infantry are drying. These figures will finish off some units in the Tricorne orbat. Then I have some highlanders in kilts and some Hessian jaegers. And then a whole mess of militia! The end is in sight. 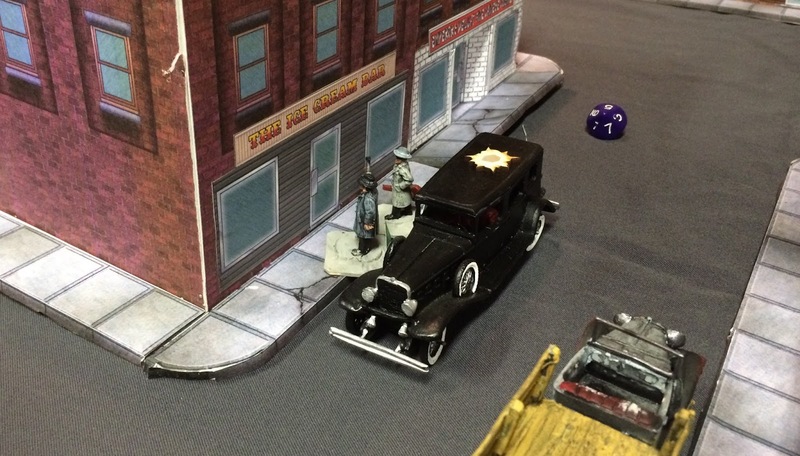 Tuesday is club night so I'm hopeful I'll get to play some more gangsters. Bruce and I got together this week for a few hours of gaming. 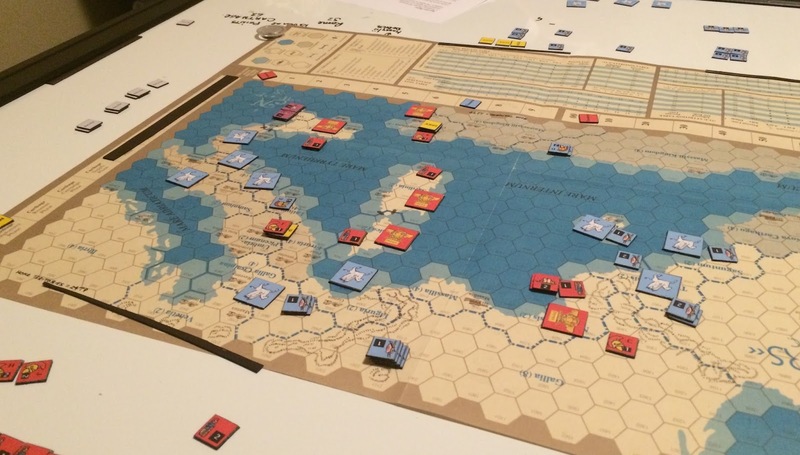 We started out replaying The Punic Wars (as a campaign engine for Aurelian). I was again Rome and tried not to make the same mistakes as last time. 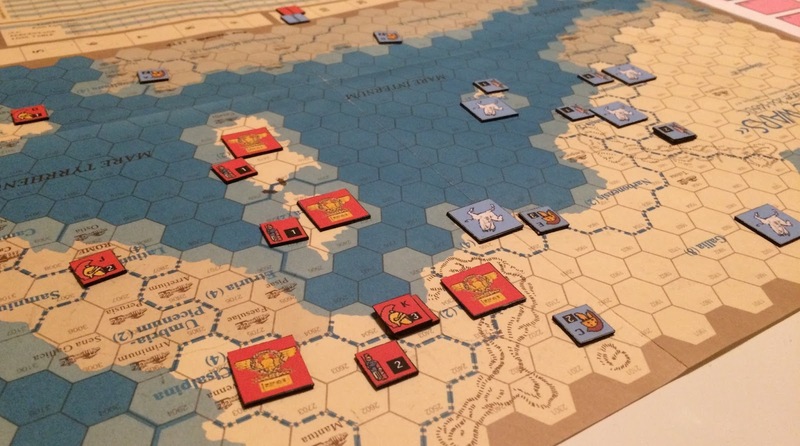 Annoyingly, I ran into the same economic issue anyhow, with Carthage way out producing me. I got a luck event (revolt in Spain) which helped me bridge the economic gap. About four turns in Hannibal decided to descend from Gallia to the coast to try and stomp Scipio's army. He has about a 3:2 advantage. 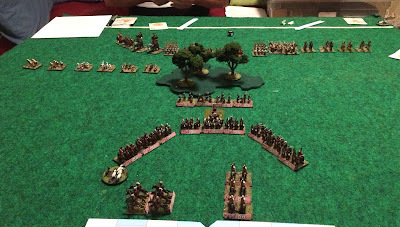 Looking forward to trying my luck on the miniatures table against the dog's breakfast of troops that the Carthaginians have to field. Bruce then brought out The Trial of Louis Riel, a new boardgame he got. 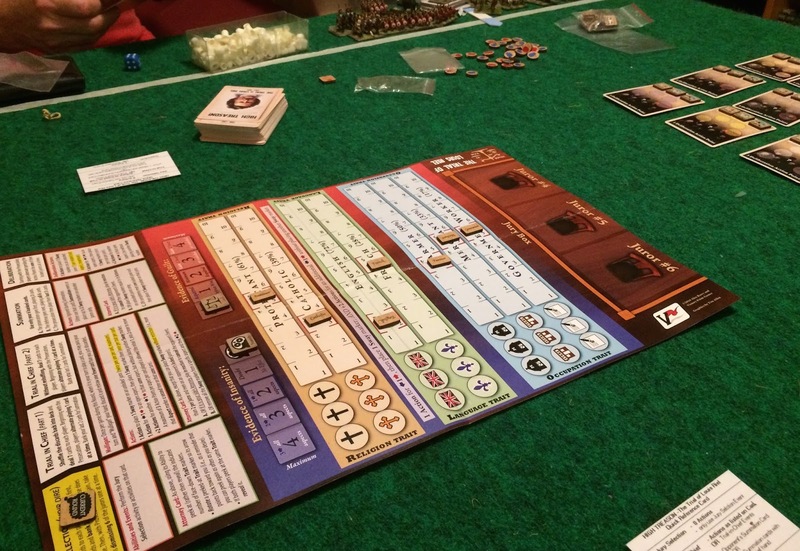 Very fun game in four rounds. First round the players use cards to reveal information about jurors (randomly assigned traits). Then the players winnow the pool down to six jurors. Then there are two rounds of card play representing the trial and here the players can fiddle the jury a bit but mostly they "make arguments" to sway particular characteristics towards their cause. This moves markers on the board and shapes the eventual scoring. For example, if the jury pool is heavily catholic, the each player seeks to move the catholic marker towards them. The final round is summation and entails a hand of cards that the players have each set aside during the first two rounds. This gives players a chance to make last minute adjustments. 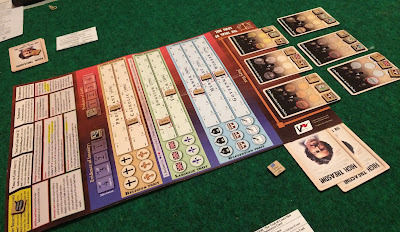 Like most card-driven games, the lesson here is read the cards you put away carefully... .
At the end you score, revealing each juror's complete set of traits and scoring them as per the tracks on the game board. To convict, the prosecution needs 100 points. There are also two tracks allowing the players to seek a win through overwhelming evidence (crown) and insanity (defence). Louis got off this round, mostly because the jury was heavily catholic and mercantile. 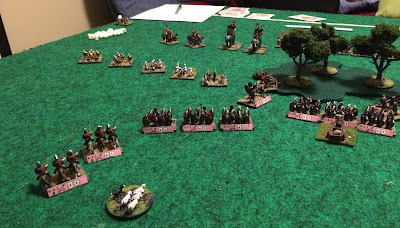 We had eight guys out for the first club night of February. 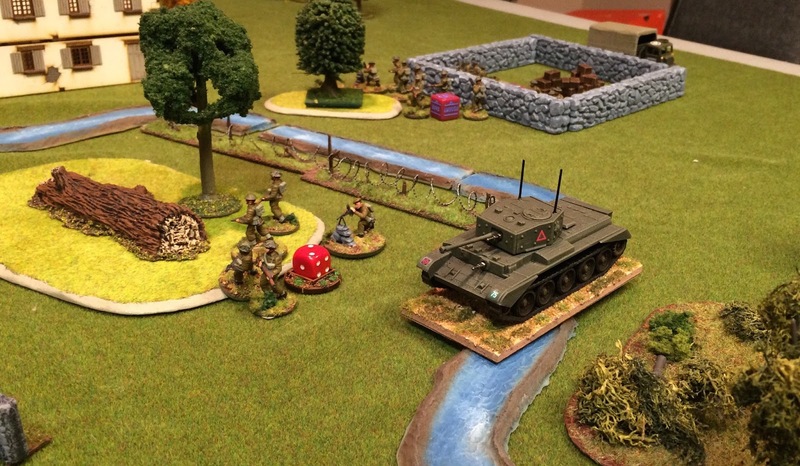 Dave and Jon hosted a game of Bolt Action (I think). 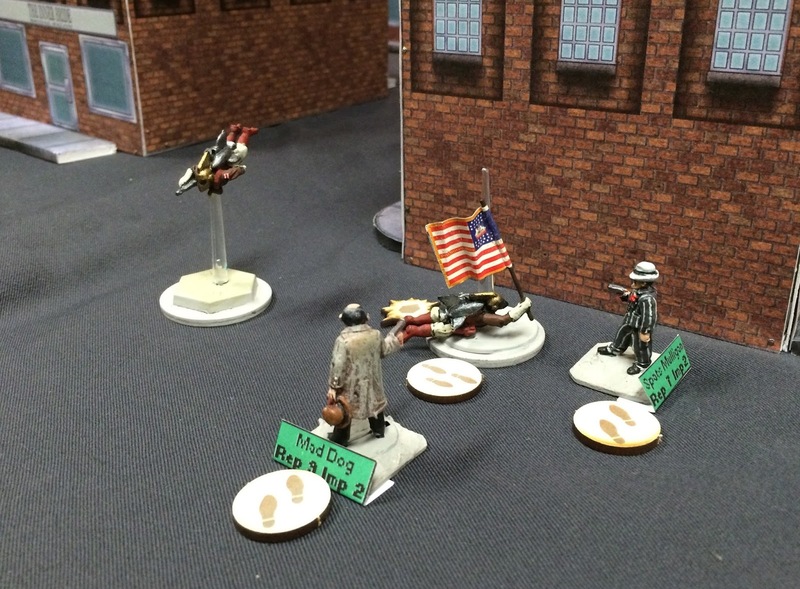 Bruce brought out a game of The Chicago Way with 28mm gangsters. Terry's crew of gangsters rolled up to an ice cream shop early on, going in to secure a bag of loot. Terry's wheels are pointing west. Cop cars came screaming in from the north. The one below took a snoot full of 45 rounds from a tommy gun and rolls to a stop. A second set of cops showed up but they were on the take and our heroes were caught in a cross fire! The second copy car (also ambushed) turned the corner and rammed the gangsters from behind! 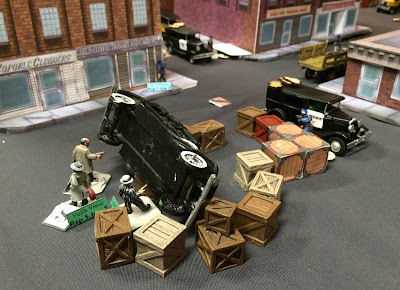 It lost control and careened into some crates (out of action). But the gangsters (somehow) lost control turning a corner to flee north of the board. 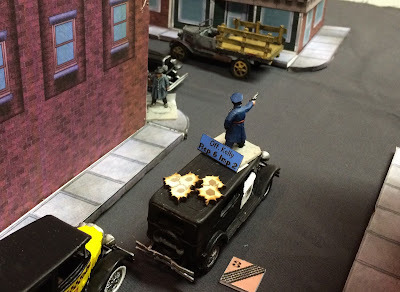 Things then dissolved into a foot chase, with the bad cops dead, the good cops in hot pursuit and the federal rocket men arriving just in time to turn the tide. 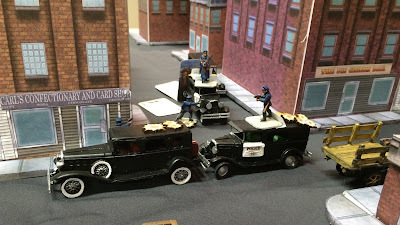 Hot rolls in te beginning of the game really made a difference for the good cops (I could not miss for the first seven turns). 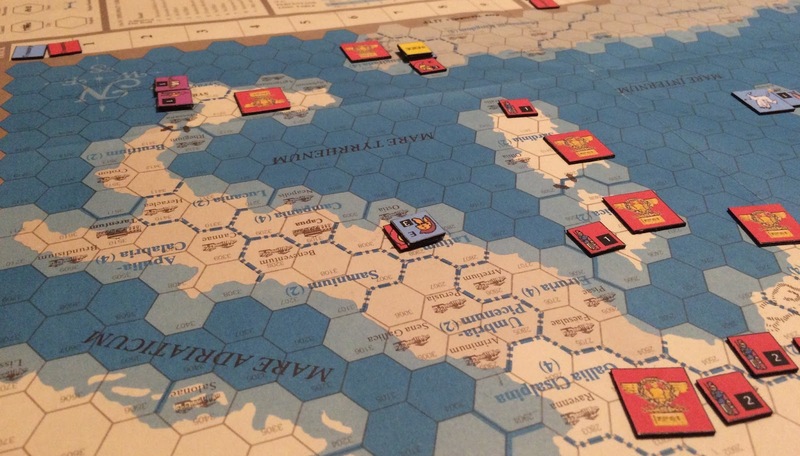 Up next: I am working on some 54mm British lights and Bruce and I are going to give the Punic Wars another go. I'm continuing to paint 54mm troops to fill out the orbat for Richard Borg's Tricorne game. This week, I took on the Hessians. I decided to go with plastics to save a bit of money. The troops I ended up with come from a children's playset (actually two sets). 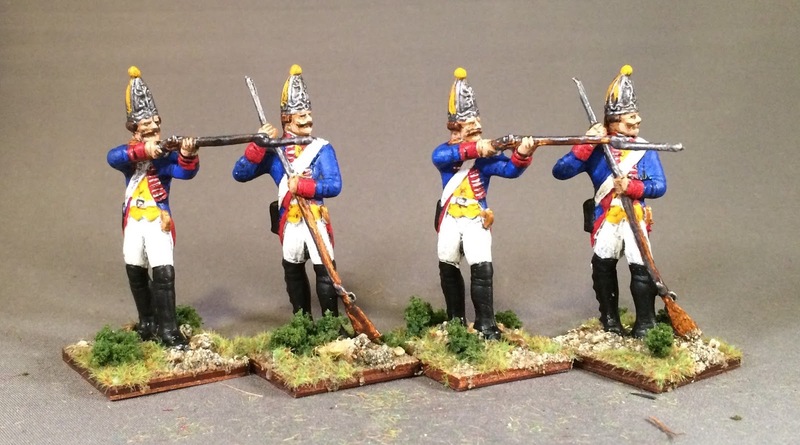 They all have the mitre cap for the grenadiers. Given the cost difference, I decided I could live with regulars in pointy caps and I started painting. There were some executive decisions required about just where the straps and cuffs started and ended. And I decided to forgo most of the fancy lace. I also ran out of the good sculpts and pressed a few of the nastier sculpts (below) into service. The faces turned out alright. 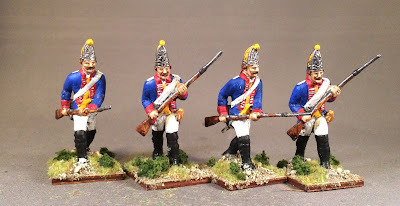 The problem I was left with was how to model the one unit of grenadiers I needed. 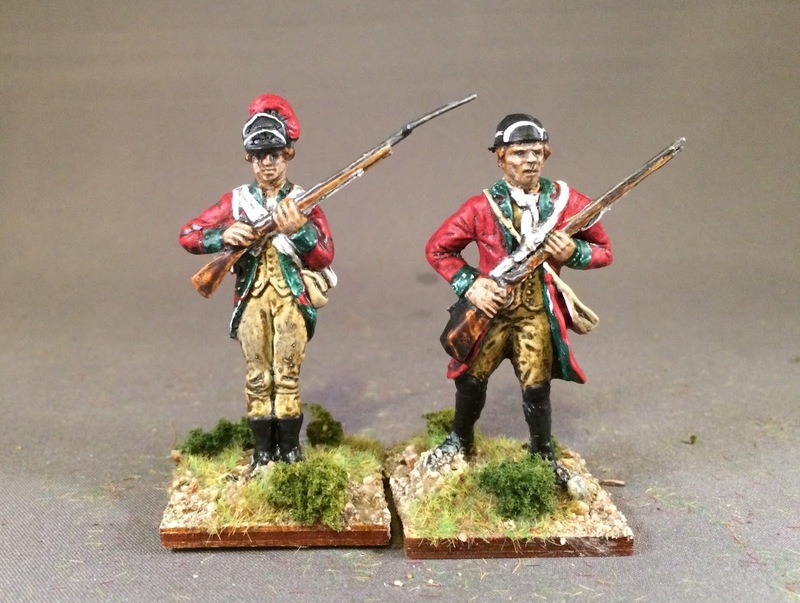 I had an extra set of British in bearskins left over. And I found one plate (likely anachronistic) of Prussians in bearskins. 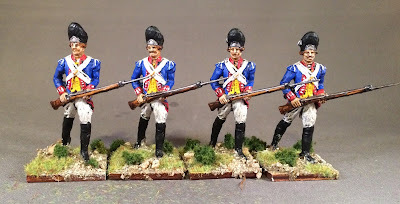 Their uniform was white (looked very Austrian) but that was too complex for gamers to keep track of so I gave them blue coats and thus the great compromise of 2017 commenced. Up next: There is club this Tuesday. 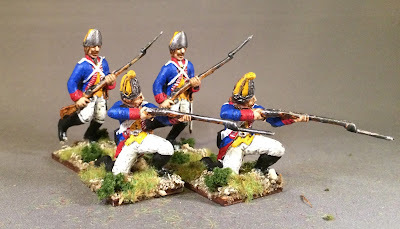 And I'm working on more British lights/dragoons while I await the metal Hessian jaegers that I ordered. A large crowd of unpainted US militia is also gathered on the side table. Bruce and I continued our Punic Wars campaign this week. 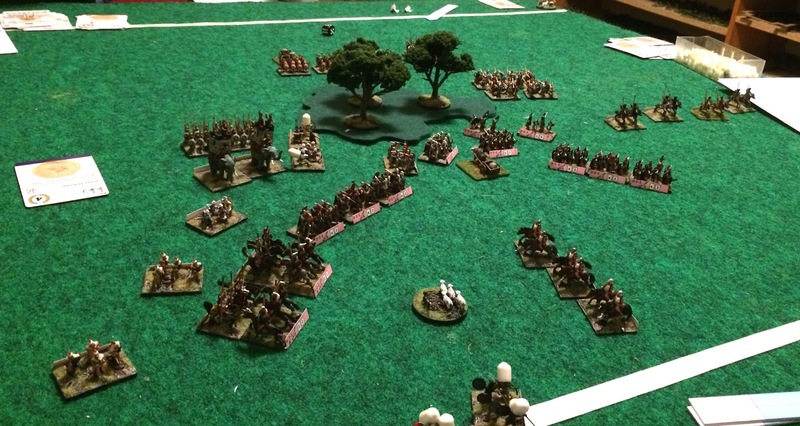 First up was a battle before the gates of Rome. The Carthaginians must put a stand on top of the sheep marker within 10 turns in order to win. The scenario required the Roman baggage train to be forward (ambush!) meaning I needed to screen it. 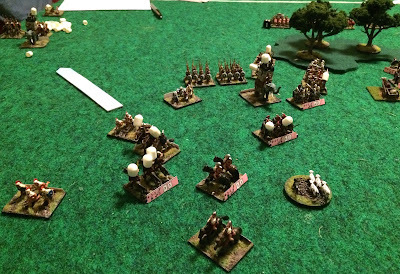 But the set-up area was such that I had to refuse both wings to protect my forward troops' flanks. Only good news was I got to place the woods. 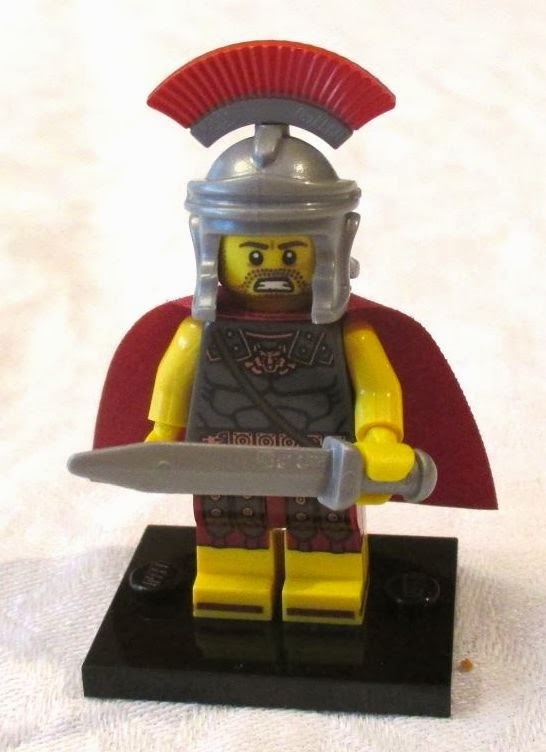 Given the time and card constraints, Bruce mostly advanced on the Roman left. We had quite the cavalry battle as we waited for the elephants to get into contact. In the end, I managed to make some lucky card plays and broke enough of his units on the table top that he ran out of time. So back to the campaign map we went. Here, things went less well. I had made an early economic error (too many boats!) in the hope of a quick siege of Carthage and could never quite match Bruce's ability to field troops and wander through Italy. I ended up taking some chances with my troops to try and undermine his economy. Then southern Italy revolted and I had to go clean that up and Hannibal snuck in and sacked Rome. What a horror show. I'd totally play this again and we're going to. Great campaign engine. Truly a strategic take on the Punic Wars.